The Nova Scotia (N.S.) Supreme Court recently confirmed that polluters must clean up a contaminated site in rural community of less than 1000 people that is approximately 10 kilometres (6 miles) south of Halifax. In the decision, the court ruled that a numbered company (3076525 Nova Scotia Ltd., referred as “307 NSL” by the court) must abide by a clean-up ordered issued in 2016 by the N.S. Department of the Environment. The numbered company owns recycling operation and the property is contaminated. The contamination from the property has spread into the groundwater and impacted the drinking water wells of residential neighbours. Contaminants found in monitoring wells on the property and in neighbouring drinking water wells include uranium, lead and arsenic. The contaminant levels exceed what is considered safe in the Canadian Drinking Water Quality Guidelines. The numbered company had claimed that the clean-up order should not have been issued at it for a number of reasons. The first reason being that is could not have known of the contamination with the exercise of due diligence. Secondly, it did not receive any economic benefit when it purchased the assets of the previous owner, RDM Recycling [referred to by the court as “301 NSL”], and took over the recycling business in 2005 and the company name. In particular, there was not any offset between the price paid and the fair market value of property. In other words, they did not receive a discount for the purchase of contaminated property that would need to be remediated. In the Court’s decision, it deemed the property “very polluted” and stated that for the past two decades the Province had received complaints from neighbours of the property about the deteriorating quality of drinking water in their residential wells. During that time, from 1997 to 2005, 301 NSL, operating as RDM Recycling, ran a recycling business on the property for construction and demolition material. 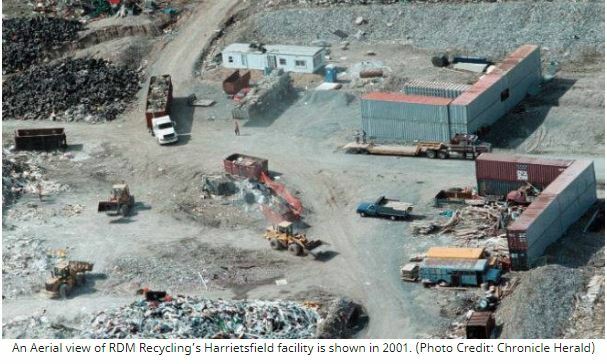 In early 2000, Nova Scotia Environment (NSE) discovered stockpiles of waste material at the RDM C&D recycling site. NSE allowed RDM to construct a one-time disposal cell on their site. It took 4 years to complete, while the stockpiles remained, and finally in 2004 RDM finished the cell and they buried over 120,000 tonnes of stockpiled waste. In 2005, the 307 NSL [the company appealing the existing clean-up order] took over the assets, operating name, and business operations of 301 NSL. It did not purchase the property. Instead, it leased the property from 301 NSL. Government Orders for the clean-up of the property date back in 2010. At that time, the clean-up cost was estimated at $10.6 million. The two companies (301 NSL and 307 NSL) along with three individuals were named in the 2010 Order. The 2016 Order before the Supreme Court replaces early Orders. The companies have never fully complied with any of the Orders. In its ruling, the N.S. Supreme Court dismissed the claims made by the 307 NSL and ruled that the clean-up ordered issued by the government was legitimate and must be followed. As such, the 307 NSL must perform remediation of the property and conduct monitoring.